5 mins preparation then 20 mins of cooking. your lentils less the coconut milk usually around 1 part lentil to 3 parts liquid) Salt and Pepper, Olive Oil, 2 Large Onions chopped fine, 4 Garlic cloves crushed, 5cm piece ginger grated finely, 1 Tbsp each ground cumin, coriander seeds, mustard seeds, cardamom pods, 1 tsp each chilli powder and black pepper. Place the lentils, coconut milk and tumeric in a pot and bring to the boil then simmer for 20 mins. In the meantime heat the oil in a casserole dish then add onions, garlic, ginger and spices (always stirring) till fragrant, about 4-5 mins.Mix into the cooked lentils. 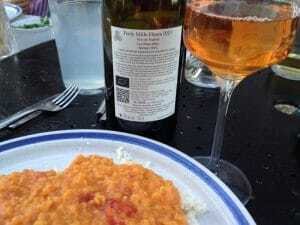 Feely Générosité semillon wine or the Mille Fleurs no sulfite added orange wine both of which have a hint of ginger and sweet spice particularly with age and go beautifully with this dish. See our top ten vegan pairings. 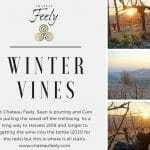 You can also order biodynamic natural and organic wine from Feely online organic wine boutique , stay at Chateau Feely; learn more about organic and wine at Wine school or read Caro’s books Grape Expectations , Saving our Skins and latest book Glass Half Full to discover the story of building this organic vineyard. You can also join the mailing list at the bottom right of the homepage to for latest news or follow us on facebook or instagram.